His political inheritance catapulted him into the Chief Minister's chair in the Indian state of Jammu & Kashmir. When one comes from an eminent political family the person’s suitability for the job is rarely questioned. But a study of the hand invariably reveals the truth. going in Indian politics, let alone being the head of state of troubled Jammu and Kashmir which requires an experienced and canny politician. Omar lacks strong Mercurian qualities, clear from his underdeveloped Mercury Mount and Finger. This means he falls short when it comes to the ability to judge human nature, mental agility, and shrewdness. Not surprisingly his father Farooq Abdullah (who was the Chief Minister of Jammu and Kashmir) does not have these weaknesses, at least not today. Omar is fairly eloquent though (a Mercurian quality shown by the phalanges of his Mercury finger) but this becomes less significant without other qualities to back it up. This means that Omar Abdullah is straightforward and trusting, almost to the point of naïveté. Add to this an inherent shyness and diffidence (the beginning of his life and headlines in addition to the shape of his Jupiter finger and strong Moon qualities) and you have a person not quite right for politics. Rajiv Gandhi also possessed a shy, diffident nature, but Rajiv had other qualities that managed to override his weaknesses. Check out hand photographs of his here and here. Omar’s Jupiter finger is slightly shorter than normal and this signifies that he has a slight deficiency on several fronts: high self-esteem and a desire for responsibility. 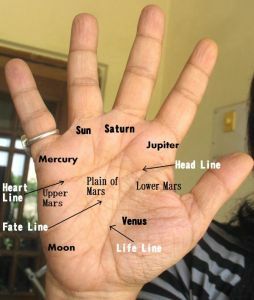 He does have a strong belief system (could be religion or country) which is shown by the Jupiter phalanges. Interestingly, Omar’s longer than average Apollo finger shows a person who wants wealth and fame. Combine this trait with the weaknesses mentioned at the beginning of this paragraph and we have a person who wants success and fame but does not possess an equally strong ability to take on the responsibility that comes with it. This sign is fairly common in average people which is why they do not achieve the fame and success they desire. Omar has qualities of a developed Mount of Moon, like a good imagination, restlessness, as well as changeability and sensitiveness. He does possess willpower, shown by a well-set and strong thumb. This shows the ability to direct others and control self. However, his lack of boldness and inner self-confidence would interfere with his leadership ability. Also, his desire for wealth and fame is out of balance in his character which would lead him to take unnecessary risks. What does his hand show that he is good at? Well, his hand shows that he is a smart man with a better than average business ability. Overall his hand shows that he is a decent, straightforward and honest person who likes people and would like to do well by them. Such people have the best intentions and from this point of view I cannot say that Omar is unsuited for politics. Simply that politics is not in his blood, at least not from his mother's (who incidently is of British origin) side. Related Reading: Hand readings of Rajiv Gandhi, Sonia Gandhi, Rahul Gandhi and his sister Priyanka Gandhi. Find out what the hands of Politicians from around the world reveal about their character. 'honest' is a word is rarely used to describe politicians in our country, right? heh heh, right! But then is that enough of a qualification to become one?